It is finaly over for another year. We fished our last pike angling competition on what was a very pleaseant day on the lake on Sunday last. 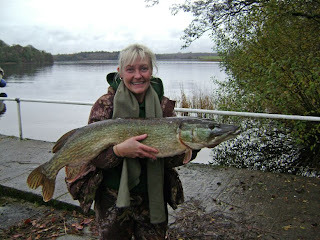 Some good fish were caught on the day, best of which was Jane Suffins cracking 20lbs 8oz pike which won the day event. 2nd was Shane O'Dowd with a nice double weighing 14lbs 12oz. 3rd was Owen Garvin with a 10lbs fish. John Nicholson will be crowned Angler of the Year in the mens league. the top tens list including the Runners up and thirds will be published here soon. The presentation of the Anglers of the Year will take place on Saturday the 6th of December in Clarke's Pub. In the meantime Well Done to all the winners of both day and year events! 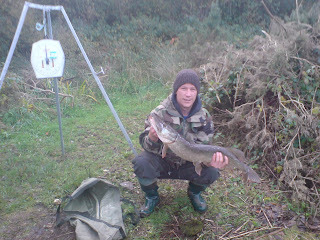 Our last Pike angling competition of the year is going to be held this Sunday, 16th of November 2008. Fishing will be from 10am to 4pm. Entry Fee: Euro 15.- per person. This is the last "Pounds recorded" competition and the decider for this years "Angler of the Year" titles in all three categories, Men, Ladies and Juniors respectively. Good Luck & Tight Lines to all competitors! that will be held on Thursday, November 13th. in Tawnytaskin School at 10 pm. On the agenda will be this years Christmas Party/Presentation of the Angler of the Year, which is scheduled for Saturday the 6th of December. Members please attend to confirm if they (and their partners) wish to attend this event, or let us otherwise know e.g. via text, e-mail or phone call by Thursday evening. We really need to know at this stage, so please be in touch. The last competition of our Angler of the Year League is going to be held on Sunday 16th of November (this Sunday coming)! This is as usual an open pike angling competition. Boat angling only! 2nd: Patrick McDonnell 9lbs 15 oz. Good Luck for the last competition on Sunday 16th. November, on Lough Key! We fished the Clancy Cup on Lough Scur on Sunday. A good was to be had, while nearly everybody caught some fish. The winner of the event winning his second Cup in short succession was David Greene with a fish of 12lbs 6 oz. 3rd: Jim Clarke with a 9lbs pike. A big Thank you goes to Ann and Des at Clancys Bar, Knockvickar for once again hosting the presentation and all their hospitality. An update of the League is to follow in due course.